U.S. Army Soldier conducting a High Altitude Low Opening (HALO) parachute jump. (Photo from U.S. Army Recruiting video, December 19, 2016). SOF News Update 20161228 – “Will Trump Break the Special Forces”, video of U.S. Army parachute riggers, British SOF depending on charity, Belgium SOF aviation capability to grow, audio interview of book author, and more. Video – MOS 92R Parachute Rigger. Watch a 4 minute long video about the job of a U.S. Army parachute rigger. Some great scenes of airborne operations. Breaking Special Forces. It is a well-known fact that the SOF units of Afghanistan and Iraq are being over-used by their countries leaders in their respective counterinsurgency campaigns. The United States SOF units have also been tightly stretched over the past 15 years. Recent comments by President-Elect Trump on the importance of Special Forces have raised some concerns. Read more in “Will Trump Break the Special Forces?”, The Atlantic, December 27, 2016. 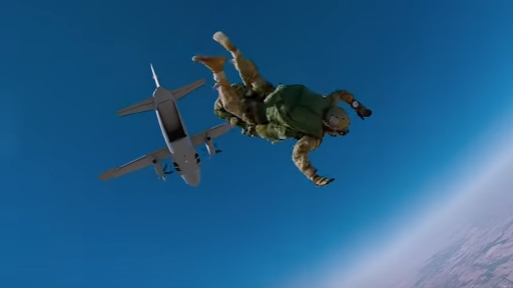 Video – Danish Special Forces. Watch a 3-min long video of Danish divers and commandos in action. Belgium to Add SOF Aviation. In a plan called “Defense Strategic Vision for 2030” the Belgium Defense Ministry reveals that they will add a new squadron of special mission aircraft utilizing STOL capabilities. Read more in a report on Air Recognition.com, December 27, 2016. Charity Benefits Brit SOF – Thankfully. It would seem that the Ministry of Defence has given less priority to the SAS and SBS than is deserved. Read a news report on the topic in The Sun (UK), December 27, 2016. Audio Interview of Book Author. Dr. Ben Jones, the author of “Eisenhower’s Guerrillas: The Jedburghs, the Maquis, and the Liberation of France”, International Spy Museum. The one-hour long interview is about the book and the use of guerrilla warfare by the United States in general. Dr. Jones is a retired military officer and served as an advisor to the Afghan security ministries for two tours.